Home › Miscellaneous › I’ve Just Been Inducted into the AK Swimming Hall of Fame! YAY!!! Maria Reeves was born and raised in Fairbanks, Alaska, where she was a member of both the Midnight Sun Swim Team (MSST) and Lathrop High School Swimming & Diving team (LHS). She started swimming competitively when she was 12 years old and loved every second. Maria first qualified for Junior Nationals in her favorite event, the 50 free, at Regionals her freshman year and kept improving from there. At her second Junior National Championship meet, she qualified for finals in the 50 free and placed 8th in the event. In February 1998, she became Alaska’s fastest female swimmer, and the 14th fastest 15-16 year old in the nation, when she won the 50 free at the Washington Open, qualifying for Nationals with a time of 23.76. In November 1998, she set both regional and state records in the 50 free with a time of 23.33. Maria helped the LHS women’s team win a state title in 1998 by earning individual first place finishes in the 50 free and 100 breast, as well as being part of two first place finishing relays. That year, Maria was recognized by the Alaska School Activities Association (ASAA) as the women’s outstanding swimmer of the year, an honor she shared with Kayla Meiergerd. In 1999, Maria was voted team captain and led the LHS women’s team to a second state title. Maria was touched out in her individual 50 free, but redeemed herself by becoming the youngest Alaskan to qualify for the U.S. Olympic Swimming Trials in the 50 free, while leading off the 200 free relay. Her lead off time was fast enough to rank her 3rd in the nation for all high school females, plus their 200 free relay set a state record time of 1:36.36, which also placed their relay 3rd in the nation that year. Maria won her individual 100 breast and was also the anchor of a record-setting 400 free relay that solidified the LHS women’s team title. In 1999, Maria shared the ASAA women’s outstanding swimmer of the year award with Emily McCoy. Maria was a six-time high school All American athlete; three of her high school records still stand today: her individual 50 free, as well as her 200 free and 400 free relays. Maria represented MSST at multiple Junior National and Senior National Championships. Maria earned a 9th place finish at the 1999 U.S. Open in the 50 free. Over her career, Maria set multiple Alaska swimming state records and was awarded several certificates of recognition for national reportable times. In 2000, Maria was awarded the Jim Growden award by Lathrop High School. Maria signed her letter of intent for a full swimming scholarship to Northwestern University in the spring of 2000 and drove to Anchorage after graduation to train under coaches Cliff Murray and Cindy Pitta while gaining long course swimming experience at Bartlett Pool. At the 2000 Olympic Trials, Maria tied for 40th in the 50 free. The highlight of Maria’s collegiate career was an individual 8th place finish in the 50 free at the 2001 Big Ten Swimming & Diving Championships where she posted a 23.32 – the hardest fought .01 time drop of her career. Maria swam all four years at Northwestern and graduated in 2004 with degrees in Radio TV Film and English. Maria has always enjoyed training as much as racing and couldn’t have experienced the success she has without the incredible support of her family, wonderful teammates, and excellent coaches. Since retiring from the sport, she has found ways to keep swimming part of her life, whether through coaching, publishing a swimming book for triathletes, or swimming for fun. To see the article as it appears on AK Swimming or to read more about the 2014 inductees, please click here. Thank you, Sandra! I’m so happy about this!!! I can’t even imagine how over the top awesome you must feel!!!!!! Enjoy the fruits of your hard work!!! It is funny to be celebrating this swim stuff so many years after the fact, but it also feels really good. 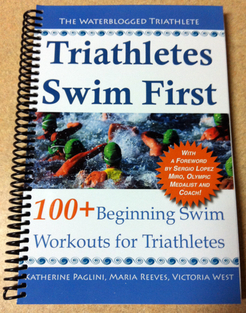 I have so many wonderful memories and swimming has been such an important aspect of my life. I have had amazing teammates and coaches and the best, most supportive family along the way. I wish I could be present to accept the award but I’m glad that my brother or Pags can be there in my stead. My fam will have to do a nice dinner or something here. Yay! Sorry you couldn’t be there either. Enjoy!